Do you shop at “TJs”? For those of you that aren’t used to tossing those two letters off your tongue without too much consideration, TJ’s stands for Trader Joe’s, a small neighborhood grocery store chain, offering convenient, unique, and great tasting foods at reasonable prices, including a large selection of healthier foods. Jamie Davidson’s recent cookbook, Livin Lean with Trader Joe’s, introduces some new recipes featuring foods found at TJs along with some helpful, practical tips for someone who is motivated to shed a few pounds. The cookbook reads more than just a collection of recipes, however. Davidson takes some time to educate the reader on up-to-date weight loss guidelines and even throws in some gluten-free and vegan recipes, as well as two weeks of restricted calorie menu plans with analysis and accompanying shopping lists. Overall, I found the recipes to be quick and simple, even for a novice in the kitchen. Each recipe features a breakdown of nutritional information and offers suggestions for sides and substitutes. This is an easy way to get started on the path to healthy eating and since you won’t be spending time planning meals for yourself, you can devote more time to other areas of your weight loss efforts. Usually, you wouldn’t find high calorie pizza on a weight loss menu. However, Davidson’s recipe for “Naan Pizzas with Pesto” trims down the calories without sacrificing taste (even my kids loved it). No need to cook tonight, because you really are just required to assemble items on the naan bread and then give it a quick bake in the oven. I found this recipe to be perfect for a busy weekday night, when you are craving a little comfort food to get you to the weekend. 2. Combine onion and vinaigrette, set aside. 4. Spread each naan with 1 Tbsp. 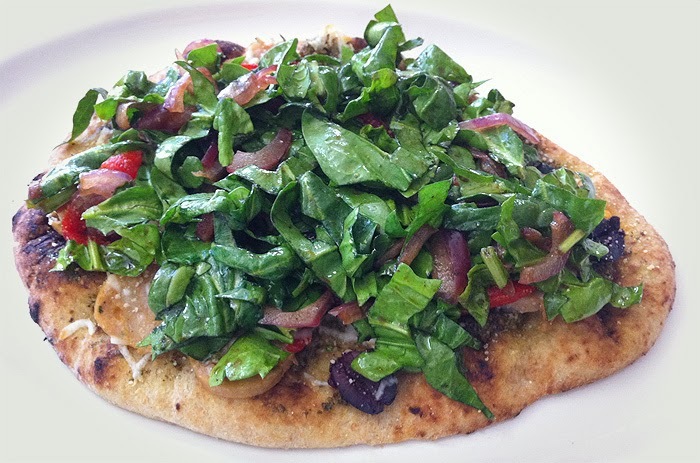 pesto then arrange sausage, peppers, olives, basil, and a layer of cheese evenly on the naan. Bake until cheese softens – about 5 minutes. 5. Add spinach to onion and vinaigrette mixture. 6. Toss to coat and arrange over pizzas. I love TJ's! Can't wait for the Tampa location to open and then the St Pete one next year. Is it bad if I say my favorite product is the Cookie Butter? It's sooo good!! But I also love their salsa and hummus, among many other things! I love Trader Joes!! Obsessed with their frozen fruit mixtures! So good, organic and CHEAP! I can't pick just one item. Everything is so good at TJs. I never would have thought to combine pesto and balsamic vinaigrette, but it sounds great! I think my favorite TJ's product is their Thai Lime shrimp skewers ... but there are SO many good choices! I love Trader Joe's. They mix up the normal day to day dinners with healthy and flavorful alternatives. We just got our first Trader Joes about a month ago. It's so new, that I haven't coined the TJ thing yet. I love their chicken sausage, so must give this Naan pizza a try. Thanks for sharing. I am a huge Trader Joe's Fan. I pretty lucky because I have one only a mile from where I live. It's my go to place for all kinds of veggies, cheese, milk, eggs, nuts... I could go on... LOL. BTW: that is a fun recipe. I've been working on a simple pizza recipe myself. I love your picture. My favorite is probably the TJ nut butters. Can't go wrong with any of them! I have never been to Trader Joe's as we do not have one where I live.